"To serve the Tao is to serve the Empire. The one cannot be parted from the other, no more than the sea can be parted from the land." Order your own copy of Emerald Empire at your local retailer or online through our website today! Your duty to your lord sends you traveling across Rokugan. As a samurai, you have studied the proper etiquette for dealing with your superiors, and you have been shown how to deal with your lessers. You have trained in the arts of court and war, and you have performed the proper prayers to ensure your safe return. Your travel papers are in order, and your horse is fresh, for you will not be following the roads for long. But if you have never before ventured beyond your home province, you may not be prepared for the spectacular beauty of this mystical land, whose very forests and mountains are alive. Prepare to embark upon your journey with Emerald Empire, the essential setting guide to the Legend of the Five Rings Roleplaying Game. New lore and tools for players, Game Masters, and fans of Rokugan fill its 256 pages, along with a key to the locales and ways of life of those dwelling within the Empire. Today, we’ll take a closer look at some of those new player offerings, as well as the cultural and roleplaying guidance detailed in this sourcebook. 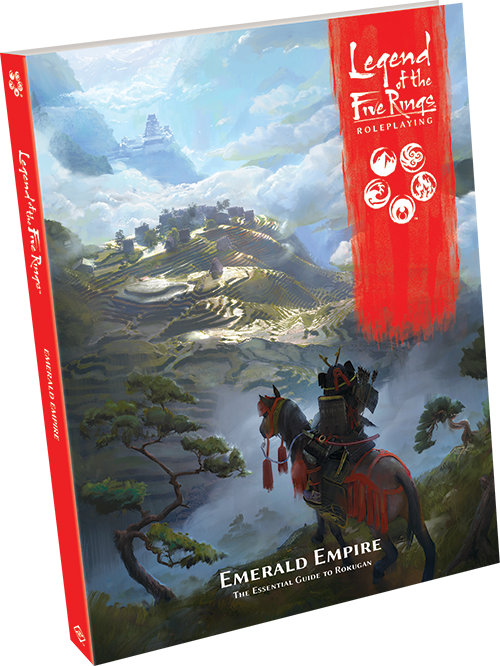 If you're a player of the Legend of the Five Rings Roleplaying Game, Emerald Empire begins by offering you new answers to the Game of Twenty Questions, including three new families, nine new schools, nine new titles, and over two dozen new advantages and disadvantages. Whereas the Core Rulebook focused on the samurai of the seven Great Clans, Emerald Empire expands players’ options to include the Imperial families, who serve not one single clan, but the entirety of Rokugan. Members of the Miya family who have trained in the Miya Herald School ride across the realm to deliver the Emperor’s news and edicts, while the family’s school of Miya Cartographers are experts at navigating and recalling the landmarks and geography of the Empire. 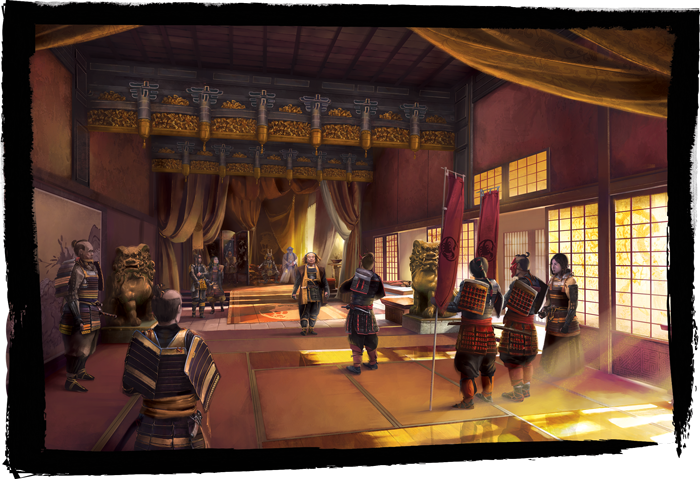 The Otomo family ensures that no clans or alliances become a threat to the Emperor, and the actions undertaken by the Otomo Schemers are shielded from rebuke by the majesty of the Throne itself. Finally, the family dedicated to the Emperor’s spiritual and physical protection—the Seppun—divines the future to warn against potential threats with the help of the Seppun Astrologers, and overcomes any physical dangers thanks to the Seppun Palace Guards. While the Imperial Families occupy the very top of the Celestial Order, monks stand outside that order. Initiates of the Fortunist Monk Order devote themselves to a Great Fortune or one of the ten thousand other deities that oversee aspects of nature or daily life. In exchange for their prayers and service, the monk may be granted special boons by the Fortune. When selecting this school, you choose a single invocation that represents the Fortune’s power, which your character can perform despite not being a shugenja, and you gain one additional invocation each time your school rank increases. Disciples of the Shinseist Monk Order focus instead on the wisdom of the Little Teacher. By understanding that all reality flows from the Void and must one day return to the Void, they can catch glimpses of Enlightenment. When you spend a Void point to Seize the Moment, you may treat your ranks in the skill as being equal to your school rank. The order’s curriculum also focuses on Kihō techniques as expressions of their elemental studies. Away from the monasteries and civilized places of Rokugan, the Realm of Animals sometimes bisects the world of mortals. Kitsune, or fox spirits, possess powerful shapeshifting abilities that permit them to travel across Rokugan and dwell among humankind undetected. Sometimes, these mythical creatures fall in love with a mortal or find themselves part of a lord’s court or retinue, where they can serve as cunning tricksters with other potent magical powers. The False Identity adversity models the stress that arises from maintaining the ruse of mortality, but at the GM’s discretion, a character in this situation who reaches Rank 2 in their actual school may spend 2 XP to learn the basics of their false school's regimen through direct exposure, deepening the deception. In addition to these trickster spirits who can be found in the most surprising of places, further secrets and conspirators span the breadth of the Empire. The Legend of the Five Rings Roleplaying Game offers a roleplaying experience like no other. With its strong focus on the complex dynamics of a society markedly different from our own, it can seem daunting to try to roleplay a character who's familiar with Rokugan’s traditions and taboos, much less try to bring the world to life as a Game Master. Complicating matters further is the overlap—and divergences—between the fictional setting of Rokugan and its real-world counterparts. Emerald Empire delves deep into the etiquette, culture, and daily life for the inhabitants of castles, cities, towns, villages, and wild places across the Empire. It also calls attention to parts of the setting that should be treated with additional consideration and respect. In each chapter, the book explores the culture underpinnings of a particular locale central to samurai life. In Chapter 1, “Strongholds of Power,” the book details the prescribed behavior of retainers in a castle during times of war or the games of court. Gempuku ceremonies and matchmaking methods, gift-giving and hostage-taking customs, and guests’ rights are all covered at length. Chapter 2, “Centers of Trade,” offers a deep dive into city life and the nuance of law, enforcement, and crime for those playing as Emerald or Clan Magistrates, or as one of their assistants. Chapters 3 and 6 explore life in the villages, countryside, and remote outposts, while Chapters 4 and 5 look at the cosmology, deities, and religion of the Empire, and how samurai are expected to act in the presence of the sacred. A detailed index also assists both players and GMs to locate important cultural concepts when they arise at the game table. 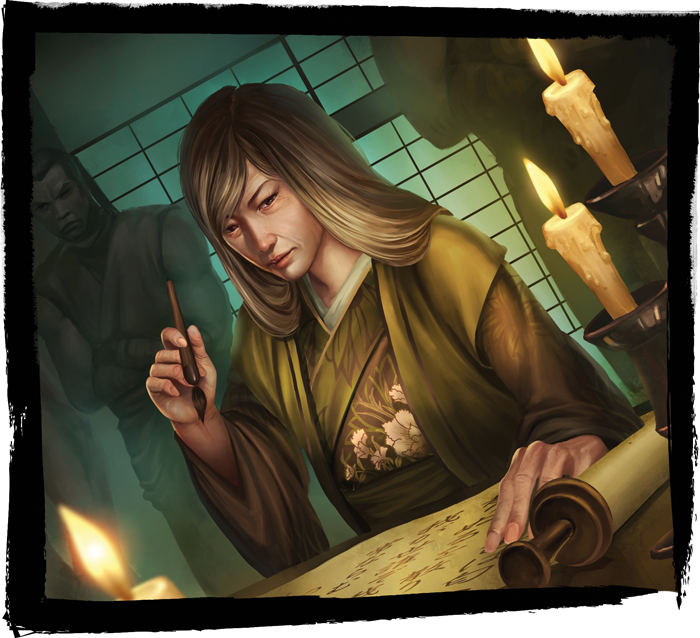 With the Empire plunged into turmoil, samurai, nobles, and monks will be called upon to serve, but their oaths of fealty and devotion may be challenged by what they encounter across the Empire. Other unexpected allies will be drawn into these same stories—but will they have a change of heart, or stay true to their original intentions? With these new player options and cultural guides, Legend of the Five Rings Roleplaying groups can explore new themes and mechanics, and better understand the setting itself. Join us next time for a closer look at the gazetteer elements of the sourcebook, as well as the setting’s history and legends! Prepare to explore the Emerald Empire with this indispensable setting companion to the Legend of the Five Rings Core Rulebook. 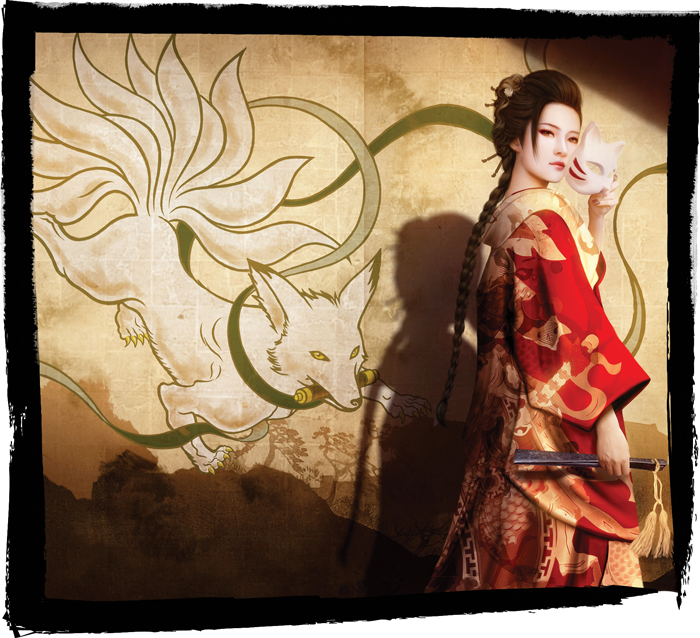 Pre-order your copy of Emerald Empire (L5R04) from your local retailer or the Fantasy Flight Games webstore today!